There is a black plastic device under the inj. pump. The fitting on the bottom of it is what looks to be leaking. I will post a pic in a bit when I get it off the camera. I have read about the hard plastic lines and need to change them I assume too but I think this is leaking at the fitting that goes in the bottom of that black device. I think that's the shut-off diverter valve. That fitting is an electrical connector. 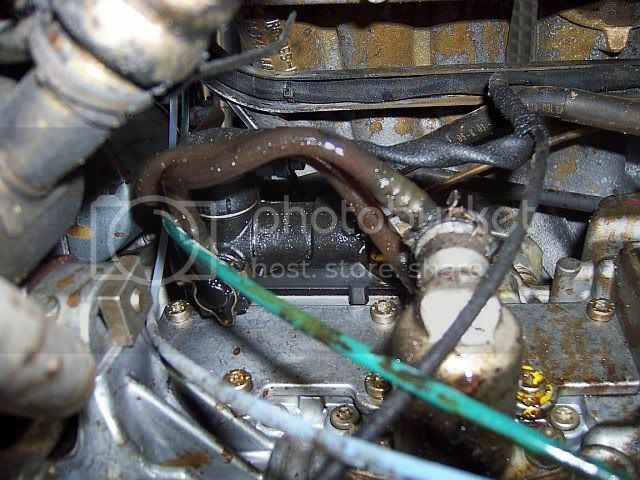 Pull it off (use a lever if necessary), if there is diesel leaking from that socket, go and buy a new shutoff valve. Easy DIY job, get a new o-ring at the same time. The valve is held by 2 torx bolts. Use degreaser to clean the area up. By the way, commonly the areas around that valve that leak, are the fuel pipes that connect to it, and the o-ring between the valve and the fuel pump. Do check they're all ok first, and that they're not the actual source of the leak. Shutoff valves aren't that cheap. I put a red pointer toward the fitting that seems to be leaking. See pic below. I assume it is not an electrical connector as it has a fule line going to it. Is there a small rubber o-ring inside that fitting? You've got quite a bit of leakage occuring above your red arrow suggesting your leak may come from above the shutoff valve. Check the 6 delivery valves on the top of the IP and confirm the leak doesnt originate there. Your fuel lines are not crystal clear and may also be leaking. You can buy new fuel lines or o-ring seals only (search under my name for "606.962 o-ring sizes") for the sizes/counts if you go that route. Also search JADAVIS name, he is selling numerous o-rings in viton on his website. Be very careful wiht the electrical connector on the shutoff valve. If it goes on and off too many times it wont connect properly and you WILL be buying a new shut off valve AND a complete engine wiring harness which will fly here from germany (rather not say how I know that). At this time, unless you are having shutdown problems that you didnt mention, you will only need a new oring to seal the valve to the side of the IP. There is no need to remove the electrical connector to do that job. Is there a post anyone knows of with better pics and maybe a break down off all parts so I can talk/ be instructed more clearly? Here are the part numbers for all the fuel lines. They have an oring on each end that dries out and fails. On occassion, the lines themselves get brittle and crack. The lines are clear when new and are yellow or brown when old. To remove, push the white horseshoe clips tightly closed (e.g. : make a ringer) to release the clips holding the fuel line to each fitting. Takes a pretty firm tug to get them off. Once off, install new o-rings or new lines (new lines are$50-$60 for the set and come wiht orings installed). Shut off valve is held in place by two torx cap bolts and has 1 o-ring seal between it and the IP. Delivery valves have an o-ring and a crush washer. Requires a special MB splined socket to remove. Ask for MORE HELP if you plan to tackle this job; while not difficult, it is a bit techinal and there are some major cautions to be gone over first. Is there any practical way to purge the fuel lines which you are about to replace before you start disconnecting them? Since they are full of fuel, I imagine it gets to be quite a mess when doing this job and the fuel in each of the five or so lines dumps out when you remove them. Is it just a matter of some disposable gloves and a lot of rags stuffed underneath the lines beforehand? Use rags. You only lose a few ounces. Clean the area well, then tape a small piece of cardboard in the area to check to see leaking patterns, unless you have witnessed the leak, leaking, you're just guessing at what is leaking. Looking closer, your attaching clip looks different than others I've seen. Mine are all plastic, looks like the attaching clip portion of yours might be metal? 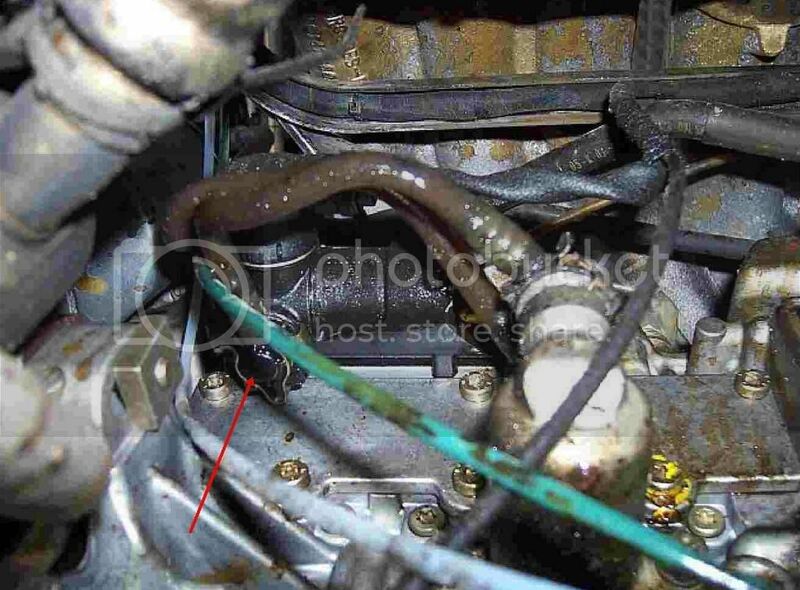 You cant buy fuel line, nor is the line itself usually the problem. The o-rings provide the seal. MB only sells the new lines (which have new rubber o-rings attached). You can get your own rubber (or preferably viton) o-rings and replace those parts only. Thanks for the PM Pweber! Anyone know the size of the o-ring in/for the shut off diverter valve? I'll get it in Viton and list it on my site also.